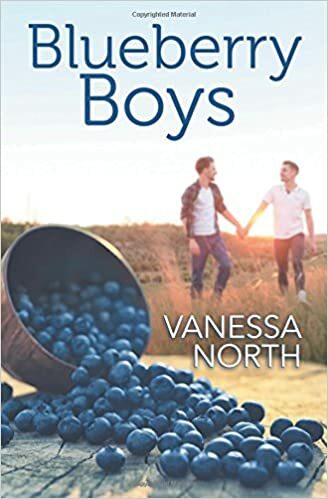 I’ve read a few of Vanessa’s books now after finding her novels last year, and this was another good read. When I want romance I want characters I can believe in, tension between them that sizzles and feels real, and a plot that keeps me reading, and gives some drama and conflict. This does all that once again. I loved both Connor and Jed and felt for them both. Connor doesn’t want to return to the town and give up his career, Jed doesn’t want to give up on farming, they both earn a living at a job that’s from their hearts and a part of them. Throw in secrecy which always comes out in the end, a family and church that Jed is certain will disapprove of his sexuality and it’s a hard time for both of them. It seems there’s no way forward for them….despite how they feel about each other. I loved the tenderness between them, the way they understood each other, the way Jed felt about his family ( oh OK, and the way he felt about his church, even though I’m ambivalent about churches and church people!) For Jed the church has been part of his family life and provides a framework for his everyday actions. I so felt for him and his speech issues, it must be so hard to cope with, people just don’t have patience, and of course so many see things like that as being a brain impediment not just a simple speech issue. To be Gay too – well, its like poor Jed really got the book thrown at him in the whirlpool of Life. It amazes me how he’s got away without being seen as Gay by his family, as he’s not a teen now but in his late twenties, early thirties – can’t quite remember. Still, people see what they want to and his family just don’t think of anything outside the traditional church nuclear family of mum, dad and kids. That’s probably true for so many families, we unconscious expect what we see around us, and if everyone is in hetero relationships that’s what we expect for all. Connor, I felt he was kind of lonely in a way, popular at work and with lots of acquaintances from there but he didn’t seem to have real friends, or have had any solid relationships. His only family is Scott and that’s a bit precarious so when he feels all in with Jed I just wanted them to find a way forward, a way to share their lives and be happy. Its a lovely read, with a story that could be so true, and people we see all the time, those who don’t think they are prejudiced until faced with something outside their norms from someone close. A curious aside about co-incidences. In one part Connor and Jed go star watching and see the Perseids meteor shower and in the book I’d just finished before this, Nicolette Hugo’s Exhibition, The Perseid meteor shower was also mentioned…small world.